Jeffrey grew up in Southern California and always had a passion for the natural world. As a child, he spent a great amount of time outdoors catching bugs and lizards. At a very young age he knew that he wanted to pursue a career working with animals. Jeffrey recently graduated from California State University, Northridge with a Bachelor’s degree in Biology with an emphasis in Ecology and Evolution. As an undergraduate student, he gained research experience in the tropical rainforests of Ecuador where he studied spiders as a field assistant and also conducted individual research projects on bats, katydids, and birds. Jeffrey was selected for Wildlife Learning Center’s internship program where he gained hands on experience with wild animals. During his internship, he worked alongside the other biologists learning a great deal about animal care and public education in the life sciences. It was during his internship that he realized how much he loves to teach about wildlife biology. 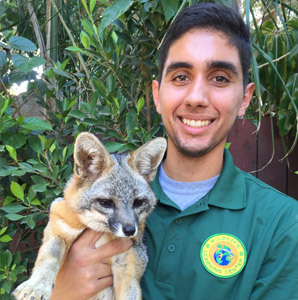 Jeffrey is ecstatic to join the Wildlife Learning Center team where he can continue to not only care for the animals, but also teach future biologists about the wonders of the natural world.